loved the cast, but the movie was boring. Simon Pegg and Nick Frost are sensational together. Great movie. Although not nearly as funny as hoped, it was still a cute and enjoyable movie. Original and Clever. I loved the characters and had a good laugh. As silly and smart as you can get. This movie surprised me in a good way. It was actually very funny. The alien is has a big personality and the actors do a great job. Lots of funny moments, a good rental. Could have been funnier but I chuckled a bunch of times. I liked all the cameos. Hilarious movie; just the right amount of humor, romance and friendship. The whole movie didn't focus on the love relationship and instead allowed itself to be refreshingly funny. LOVED Hot Fuzz and Shaun of the Dead, but this was just a complete let down for me. It didn't help that I had very high expectations for these guys, but I don't think that even the lowest of expectations could have saved this one. This movie was ok. The trailer made the movie look really funny, but I didn't laugh as much as I hoped too. Hilarious movie, One of my favorites. Loved this movie. Hilarious. Seth Rogen never lets me down. Really good movie. Rogen does a great job as his voice. H-A-H! *sigh* I'm such a sucker for Simon Pegg and Nick Frost. 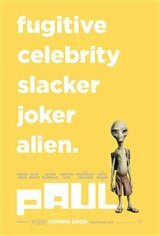 A funny, silly alien, it was pretty good, a little predictable, but good enough. Brilliant. Already seen it twice. Can't wait for the DVD so I can see it again. Starts off kind of crude, but once you get into the story, it was a hoot! Even my wife loved it and she's not a big Sci-Fi fan! This movie could have had a few more laughs but it was enjoyable for the most part. It ran a little bit long but all the cameos and nerd jokes were worth it. this ET also wants to go home, but mother- Earth-lings have corrupted it so badly that it is not great fun to watch. Funny movie, but far too much vulgar language. It wasn't a necessary part of the movie - that part actually prevented me from recommending it to anyone else. it had it's moments. it was entertaining. Pretty funny movie, most of the funniest parts were given away in the trailer. Paul was not too much of an alien, still felt like I was watching Seth Rogen on screen. So funny. I laughed throughout the whole movie!! I would definetly watch it again. waste of money, wasn't that funny, best part was when it was over. Another great movie from Simon Pegg and Nick Frost! Seth Rogen was a perfect choice for the wise cracking Paul, an alien who's been around us humans far too long. Any fan of sci-fi will thoroughly enjoy this film. There were a ton of in jokes from a country western bar playing the tune from the cantina in Star Wars, to a toy playing the famous tune from Close Encounters. This movie was hilarious from start to finish. Terrible movie...for too many reasons to mention. This movie had some really funny parts. Had some funny parts, but overall not a great movie. Fun enough - a lot of sci-fi references, in-jokes, and quotes from classic movies. If you like that, this movie is fine. If you don't, you probably won'y like it.